Founded in 1981, by Kostas Sotiropoulos, the Hellenic Five specializes in music for the traditional cultures of Greek people. Their extensive repetoire includes traditional folk dance music to the contemporary music heard in Athens today. The Hellenic Five has also appeared on CBS’s Early Edition in an episode entitled “Run, Gary, Run” and on the Food Network with Bobby Flay. Their original music was also featured in both appearances. 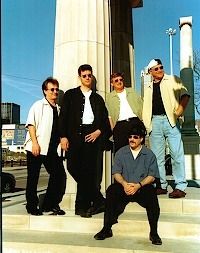 Locally, the Hellenic Five plays for many “Greek Nights”, festivals, night clubs and restaurants. Venues include Grant Park’s Summer Dance, Park West, Excalibur, a long stint at Cairo every Wednesday night for 5 1/2 years was one of the Club’s most popular evenings, Pegasus Rooftop for 3 years, Kallisto, Byzantium and Barrel Café. At the Chicago Cultural Center, The Hellenic Five gave performances in tribute to Melina Mercouri, Yiannis Ritsos and Stelios Kazantzidis. The Hellenic Five is in demand when it comes to backing up singers and dance groups that come to the United States from Greece. The Hellenic Five has also played for many charitable organizations and benefits such as The Leukemia Society and The AIDS Foundation. They are also especially sensitive when it comes to helping raise money for children, who come here from Greece and other countries abroad, needing operations and or transplants. Instrumentation includes bouzouki, clarinet, guitar/bass guitar, keyboards, drums, percussion and vocalists. 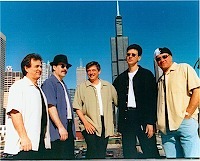 The Hellenic Five has a CD of eleven original songs. Members of the group can also be heard on Jim Stoynoff’s “ Return to Our Roots”, numerous recordings by other recording artists and are now in the studio for their next album.